CUSAT(Cochin University of Science and Technology) is academically structured into 9 faculties: Engineering, Environmental Studies, Humanities, Law, Marine Sciences, Medical Sciences & Technology, Science, Social Sciences and Technology.Admissions are based on an All India Entrance Examination known as the Common Admission Test (CAT) conducted by the University which includes papers for admission to undergraduate and postgraduate courses. 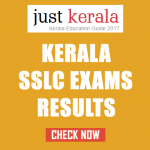 Check Latest CUSAT 2017 Exams Results , CUSAT CAT Results 2017, CUSAT 2017 UG and PG Results 2017 . CUSAT conduct examination for 27 Departments of study and research offering Graduate and Post Graduate programmes across a wide spectrum of disciplines in frontier areas of engineering, science, technology, humanities, law & management. The results of the CAT/LET will be published in the web sites www.cusat.nic.in and www.cusat.ac.in and will also be available with the Director, Public Relations and Publications , CUSAT. Just Kerala team wishes all students appeared or appearing in exams , a VERY ALL THE BEST for thier results and better academic future.